Schlage is back this year at CES and has a few new offerings up their sleeves for the SchlageLiNK system. You may remember that we first learned of the SchlageLiNK system last year at CES, and then we posted a full review of the system just a few months later. This year Schlage introduced a partnership with Alarm.com that will enable greater whole house control when integrated with a SchlageLiNK system. I spoke with Colin Murray from Alarm.com and he gave me a brief walk-through of the system. The system they will offer through one of their local distributors will tie in to the SchlageLiNK lock, and when you enter your door code, your alarm will arm or disarm depending on whether you are locking or unlocking your door. 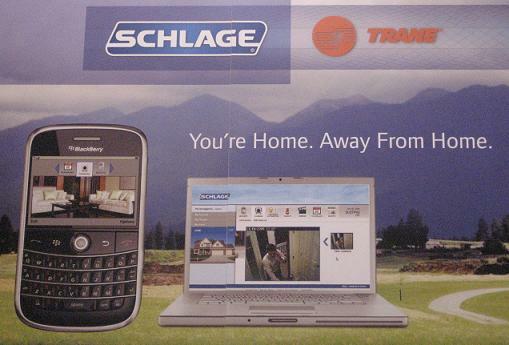 Like Schlage, they will have a web portal and a BlackBerry app that you can use to control your system. Fee's have not been set yet, and release is about 2-3 months away. We'll keep you updated as more information becomes available. Also new from Schlage is a Home Energy Management system. Many of us suffer from high energy bills, and wish we could lower them. This new solution from Schalge uses additional Z-Wave components at various parts of your home to monitor your energy consumption. A new web interface is being created, and will allow the user to see energy consumption and what that energy is costing them, and help create a budget to help lower your energy use. All in all, I think Schlage has some great things in store for us in 2010 and you can count on CrackBerry.com to keep you posted on the new developments.